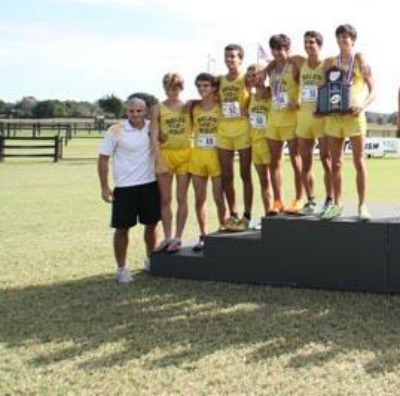 Frankie Ruiz, head cross country coach at Belen Jesuit Prep School in Miami, has led his team since 2002 and had pushed his team into the top ten in the national cross country team standings. Ruiz has been instrumental in developing the cross country runners of Belen Jesuit, his Alma Mater, to the level in which they currently are at. Although Ruiz has made such tremendous contributions to the success of the Belen Jesuit Prep cross country program, his contributions to the sport of running have gone much further. Ruiz began running in 6th grade at Belen Jesuit through inspiration from his father, who had also attended Belen Jesuit Prep. He developed such a love for the sport and has been involved with it since then. Ruiz was coached by Carlos Barquin, the current Belen Jesuit Prep Athletic Director. “I really got hooked on cross country in High School. My dad inspired me because he was the Belen Jesuit 880 yard record holder, which was an indicator that I should be running. I began running in 6th grade and it was my first team running experience. The two people I looked up to in running were my father and coach [Barquin]. 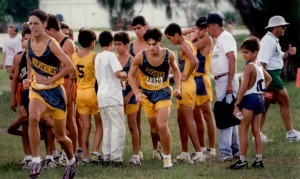 In 1995, when Belen Jesuit won its first team state championship, Ruiz took the role of being the 8th runner on the team, meaning he did not participate in varsity races. He took the role with pride and knew that if he waited his time he would be one of the top guys soon. When he graduated from high school, he was one of only a few runners from the school that went on to run in college the next year. With his personal experience as being on the JV squad when the team won the state meet, Ruiz feels that he can help to motivate runners that are in the middle or at the back of the pack to keep going. Following his years running for Belen Jesuit, Ruiz remained in his warm city of Miami when he took his talents to Florida International University. At FIU, Ruiz ran track and field by competing in the 800 meter run and high jump. 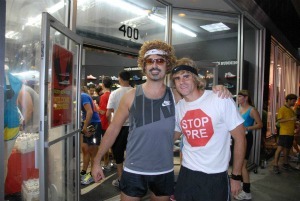 Coach Ruiz has shown an incredible passion for both his Miami community and his love for running in multiple ways. By staying in Miami for college and never wanting to leave, he has been able to contribute a lot of time and good deeds to the local community. His obsession with running has led him to different opportunities such as coaching his former high school’s cross country team and being a part of getting his community healthy. A great deal of the work Ruiz has done has plenty to do with helping the youth get involved and remain healthy. Through programs, such as the ING Run for Something Better Kids, he has shown his commitment to making the children in the community better people and allowed them to live healthier lives. This Run for Something Better Kids program is one of the largest childrens running events in the world. By helping the youth of Miami, Ruiz has demonstrated not only his love for the sport of running, but his commitment to bettering the community around him. He has also shown his enjoyment in working with young children and helping them set steps to give the community a better chance at being healthy in the future. He has proven himself to be a fantastic leader in the community surrounding him. 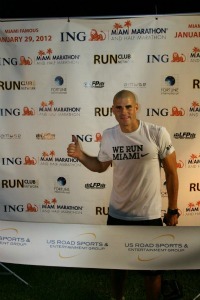 Ruiz has also been significantly involved in the starting and continuing to promote the ING Miami Marathon. As a middle school coach, Ruiz wanted to inspire his runners and was informed that the longest race available in Miami was a half marathon. With help from others, including the city mayor, Ruiz was able to put together this marathon, which started with only a few runners in 2003 and has evolved to involve well over plenty more in 2011. Another big influence Ruiz has had on the running scene of Miami has been by his developing of run clubs throughout Miami-Dade County. He started up a run club about three years ago with a focus that varied compared to typical run clubs. The goal of this run club was to make running a social thing and allow for all individuals to be more connected. The run club is sponsored by Nike and has become quite a success. Ruiz has also helped in getting a run club made at FIU. This massive amount of work Ruiz has done for his community is all motivated by his love for Miami. All of these accomplishments made by Ruiz don’t overshadow the fact that he has led Belen Jesuit Prep to be one of the top teams in not only the state, but in the entire nation. Belen Jesuit is among the top ten teams in the nation and has been one of the top teams in Florida for multiple years running. All of his feats in running, along with having to work to make money, make Ruiz seem like such a busy guy. The juggling act he takes on has shown that he has the strength to overcome multiple problems at once and succeed in all of them. Through coaching, being involved with Miami running events, and traveling a lot, Ruiz has been involved in working at his running store. Ruiz has looked toward the future as he plans for even more success for the Miami Marathon and for the Belen Jesuit cross country team. This year, Ruiz hopes to lead Belen Jesuit Prep to a team title at states and hopes to have Elliot Clemente as ready as possible to try and win at states. Ruiz also has high hopes for the team in the future and plans on being able to prepare them even better than ever before. Frankie wants to allow the Miami Marathon to grow as well. He hopes for there to be over 25,000 participants as they are heading into the 10th year of the race. In five years from now, he hopes to see about 35,000 runners and for the race to become sort of a Latin Championships. As a child running cross country, Frankie Ruiz got a spark in his mind that attracted him so greatly to the sport of running. He continued running through high school and college and has inspired many to push themselves to keep going. Through work with the youth of Miami, starting the ING Miami Marathon, and hosting a run club, Ruiz has motivated many to live healthier lifestyles and become connected with others while doing so. His passion for his city and the sport of running has led him to give so much to both. Now coaching one of the top teams in the nation at Belen Jesuit, he has shown that he is very knowledgeable about running and has allowed him to give even more to the community. Ruiz is a hero in Miami and an inspiration to others around the world.